Artificial intelligence (AI) isn’t going to start giving out legal advice — that is, it won’t replace your attorney — but it might help you receive better legal service. At least this is a key finding in a survey from HBR Consulting, an advisory, managed services and software solutions firm. HBR Consulting interviewed law department executives from more than 50 companies, many in the Fortune 500, to understand AI trends. It’s still early days with only 6 percent having implemented or piloted AI, but interest has been gaining steam: 14 percent have identified a use case, 23 percent are exploring potential use cases and 26 percent know they need to start looking for one. “In an industry that is typically slow to embrace technological innovation, AI has gone from anecdotal use in e-discovery to the shortlist of law department optimization initiatives in under two years,” the report states. 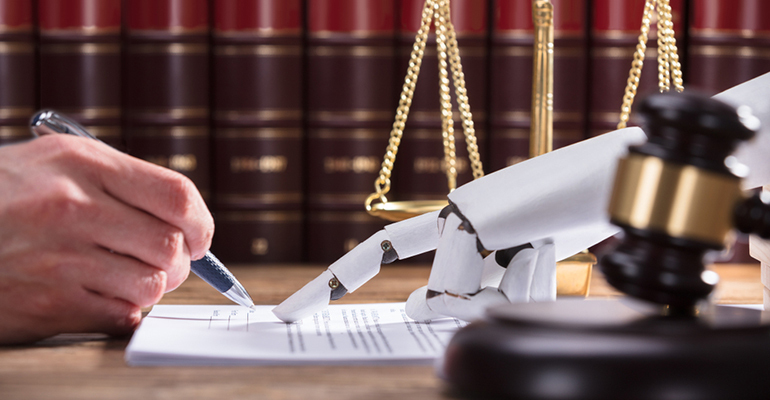 When considering AI, law departments eye three main objectives: increasing productivity without increasing head count and relying less on outside counsel, improving law department operations and enabling self-service for clients to perform such tasks as preparing routine agreements. Digging deeper, the survey found that the biggest opportunity by far for AI today lies in contracts analytics, not e-discovery analytics. That’s because too many law departments do a poor job tracking and managing contracts and contractual obligations. But AI can help in contract life cycle management, with several AI applications already on the market, HBR consulting says. Of course, AI still has limitations with contract life cycle management. Just ask global law firm Baker McKenzie, which is adopting AI in 11 offices over three continents in hopes of transforming the speed of document analysis. Either way, the future of AI is not contained to contracts. HBR Consulting sees AI assisting with predicting outcomes, enhancing early case assessments, automating knowledge management, improving internal efficiencies – but not replacing attorneys. “AI is expected to enhance productivity and services, but not serve as an absolute replacement for attorneys,” the report says. Not everyone agrees attorneys are safe from the AI apocalypse. A PwC study revealed signs of client frustration over the speed of legal service delivery. Perhaps AI can solve this problem. Consultancy McKinsey estimates 22 percent of a lawyer’s job and 35 percent of a law clerk’s job can be automated. Even HBR Consulting’s survey hints at a future of fewer humans inside legal departments. All of which begs the question: Will AI eventually handle the rest? “If I was the parent of a law student, I would be concerned,” Todd Solomon, a partner at law firm McDermott Will & Emery, told MIT Technology Review last December.